Great view on the golf course enclosed lanai & beautiful wood floors. This (Emma floor plan) 1671 Sq. 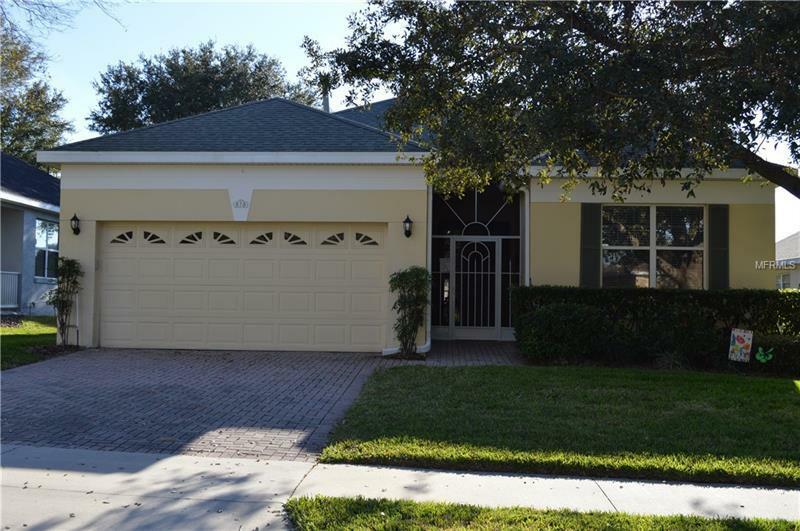 Ft. home is in a gated golf community in the rolling hills of Clermont. It has 3 Bedrm/2 Bath & a bright & sunny view of the golf course (hole #17) of Sanctuary Ridge. It has a paver driveway & sidewalk 2 sets of patio doors that enter unto the screened lanai/vertical blinds. It is priced to sell. Master Bedroom has a lg. walk-in closet Master bath has double vanities shower/separate garden tub. Kitchen has 42" cabinets gas appliances kitchenette has eating area also up-graded fixtures fans & lighting. 3rd bedroom perfect for den or office. Other features incl: indoor laundry designer tile floors/wood floors & a 2 car attached garage. All this with a 28000 sq. ft. clubhouse which incl. full time Activities Coordinator 8 lit clay tennis courts indoor /outdoor swimming pools/gazebo fitness center/locker room & sauna billiard rm shuffle board boccie card rms arts & crafts rm ballroom/stage & dance floor baseball diamond Theater Club aerobics 19th Hole (bar library & movies) & too many activities & clubs to mention. Great location; 4 mi. off turnpike 30 min from Disney or Orlando airport shopping restaurants South Lake hospital Sumter Community College LK CTY bike trail lots of lakes for fishing & National Training Center. HOA incl. all clubhouse facilities basic cable security & all yard maintenance. The Resort lifestyle you've been waiting for. safe & golf cart friendly. Pet Restrictions: leashed and cleaned up after.